The term itself is pretty archaic. It was coined by mechanics in the 1890s who were used to working on the old big-wheeled penny-farthings that had been around for about 30 years. 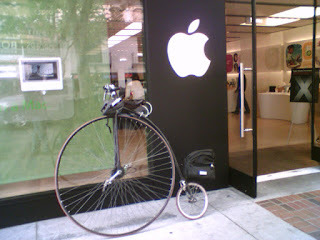 A bike with 50 gear inches to it would travel the same distance per turn of the pedals as an old penny-farthing with a wheel 50 inches across. So why do people still think of bikes in terms of a machine invented before the 20th century? To understand, first it's bets to know how to calculate a gear inch. It's really simple too. A bike has two gears on it, one on the front that's connected to the pedals called the chainring, and one attached to the rear wheel sometimes referred to as a sprocket. To get the gear inch you count the number of "teeth" on the front chainring, divide it by the number of teeth on the rear sprocket and multiply it by the diameter of the wheel. That's it! Presto, you have yourself a gear inch. Some mechanics stop at dividing the front chainring by the rear sprocket, but that only tells part of the story. It gives you the "gear ratio," or how many times the rear wheel turns for each turn of the pedal. But there are lots of different sized wheels, and widths of different tires, so that doesn't mean too much. A bike wheel 29 inches across is going to go way farther than one 20 inches across. More popular in Europe is something called "meters of development" or sometimes "rollout." Instead of multiplying the gear ratio by the wheel's diameter, you multiply it by the wheel's circumference. This way, you know exactly the distance traveled with each pedal. Usually it's measured in meters, so maybe that's why it's had such a hard time catching on on this side of the pond. There's one other way, and it's probably the most arcane of them all. "Gain ratios" are a concept pioneered by the bewhiskered bike guru Sheldon Brown. His idea is a lot more complex because it brings in the length of the pedal arms on the bike, called the crank arms. The gain ratio of a bike tell how many times farther a bike rolls compared to the distance a pedal travels in its orbit when it turns. The idea is that it factors in every possible difference in leverage a rider would feel between crank arms of different lengths. I guess when you're really cranking, ever lever-bit counts. Check out his website for a more in depth rundown of how they work.